Very few of our patients have teeth like hers! Many of our patients have perfect teeth without a single filling. Many others do not. While we are tempted to only post photos of our patients with beautiful teeth, that would not represent what many people face today. So why do that? We’re out to help our patients achieve the smile and confidence they want, not create fake, airbrushed Vanity Fair models. John was finally able to smile again with a new bridge! Photos and dentistry by Dr. Nicholas Calcaterra. John had a bad experience at the Aspen Dental in Orange, CT. As you look at his photos, you can see he has multiple missing teeth, large silver colored fillings, and generalized stain. His biggest concern was the gap between his lower front teeth. He was unable to smile and could no longer eat the foods he used to enjoy. We listened. We presented John with all his options. As a current smoker, dental implants would have been less predictable. We ultimately decided upon a dental bridge to replace this missing lower teeth. Given his past dental problems, this was going to be a bridge over troubled waters. On cementation of the bridge, John was a changed man. He was able to smile again and enjoy all of his favorite foods. John’s experience was a testament to the fact that anyone can benefit from modern, twenty-first century dentistry. The Best Dental Bridge Photo Ever! John’s bridge before we permanently cemented it into this mouth. Photo Dr. Nicholas Calcaterra. Patients often ask us what a bridge actually looks like. Well there it is! 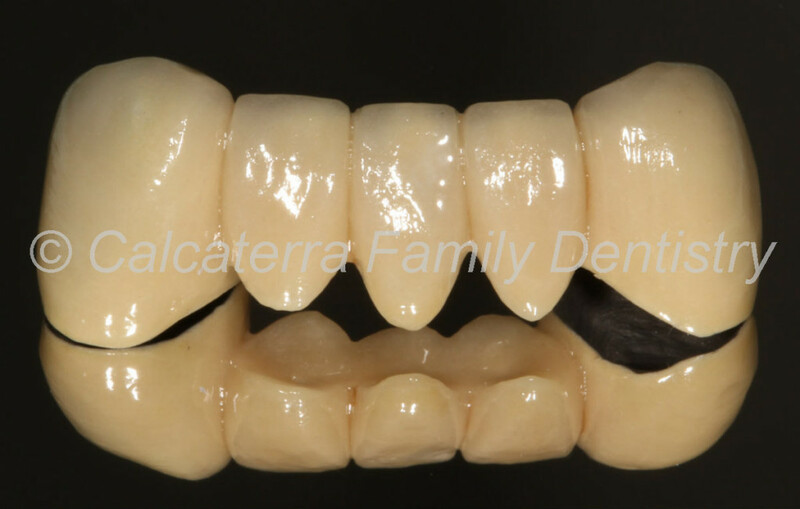 For John, given his past history of dental problems, we used a durable style that has a thin layer of metal underneath. But no one can see the metal. John’s experience was so positive that we are happy to say that there are no more troubled waters. Just a happy patient comfortable with his smile. Do you have a less than ideal smile? We won’t judge you – we’ll listen to you and work with you to identify the best solution. Contact us anytime.